Intel has taken the wraps off the new 45W hexa-core CPUs belonging to the 8th generation 'Coffee Lake-H' family. The SKUs start from the quad-core Core i5-8300H and go all the way up to the hexa-core Core i9-8950HK. As one of the new aspects of Coffee Lake, Intel is touting what they call 'Thermal Velocity Boost', a technology that offers a maximum turbo single-core boosts up to 4.8 GHz under certain conditions. Intel has finally revealed details of its upcoming 'Coffee Lake-H' (CFL-H) 45W chips. These CPUs belong to the 8th generation family and are fabricated using the 14nm++ process. Till now, the 'Coffee Lake' family comprised of the S category of desktop-class CPUs starting from the 65W quad-core Core i3-8100 to the 95W hexa-core Core i7-8700K. Gaming and multimedia notebooks have immensely benefited from the 45W 7th generation 'Kaby Lake' chips, particularly the Core i7-7700HQ, as they offer the right balance of power and portability. Now, Intel wants to up the ante by introducing 45W 8th generation chips with added cores and boosted clocks. Let's check out what these new chips have to offer. Intel now has a very formidable lineup of options in the enthusiast mobile space. The 8th generation mobile CPU family now broadly encompasses the U- and H-series processors. The U-series 'Kaby Lake-R' chips are rated at a 15W TDP and are great for road warriors. They now come updated with Iris Plus graphics — a significant step up from the UHD graphics commonly found in this segment. The H-series is where the action starts and it comprises of the Intel 'Kaby Lake-G' with Radeon Vega M graphics, the new 45W 'Coffee Lake-H' chips with optional Platform Extension via Intel Optane, and finally the enterprise grade 45W Xeon E CPUs with Intel vPro. Intel is positioning the standard 45W CFL-H chips as the CPU of choice for mobile gaming and content creation with the Platform Extension variants being targeted at high-end virtual/mixed reality consumption and simultaneous gaming and streaming without significant frame rate loss. 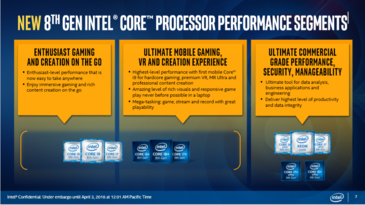 Intel's bid to increase core counts is just one aspect of the new launch. The other is the introduction of the Core i9 series into the mobile enthusiast lineup, which till now topped off with the Core i7s. We did speculate about the introduction of the Core i9 in the CFL lineup so this isn't exactly surprising. The Core i9-8950HK is Intel's crème de la crème offering in this family but it is not the exact Core i9 you've come to expect. The Core i9 first made its mark in Intel's high-end desktop (HEDT) offerings in the form of the 'Skylake-X' Core i9-7900X and the Core i9-7920X as an answer to AMD Threadripper. With 10 cores and 20 threads, the Core i9-7900X runs at a 3.3 GHz base and up to 4.5 GHz turbo with a 160W TDP envelope and costs half an arm and a leg. The new Core i9-8950HK, however, is more lenient. With a 2.9 GHz base clock and TDP rated at 45W, you'd be forgiven to think that this is bears semblance to a Core i7-7820HK from the 7th generation 'Kaby Lake' family — which it indeed is. However, the turbo boost clock is where things get interesting. We will get to that in a bit. The new chip plays well with the new Intel 300-series chipset. The 300-series chipset will feature enhanced I/O and audio along with, for the first time, integrating Gigabit Wi-Fi and USB 3.1 Gen2 onboard. Generally, both Wi-Fi and USB controllers are supplied by third-parties and interface with the chipset on the motherboard via PCIe lanes. We've been hearing about Intel's plans for integrating USB 3.1 and Gigabit Wi-Fi onboard their upcoming 300-series chipsets for quite some time now and it is good to know that the chip maker has finally delivered in this aspect. Integrating Gigabit Wi-Fi and USB 3.1 Gen2 directly on the chipset will free up some of the PCIe lanes. It might not mean much in the real world given that the 300-series chipsets can sport up to 24 PCIe 3.0 lanes. 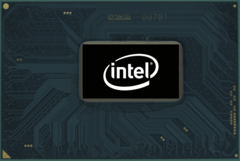 The new chips also make good use of Intel Optane memory and the Platform Extension variants of these CPUs feature out-of-the box support for Intel Optane memory. Together, Intel is promising significant improvements in load times and acceleration of everyday tasks. Thermal Velocity Boost - Benefit or Gimmick? While the Core i9-8950HK shares a lot in common with its older cousin the Core i7-7820HK, including the unlocked multiplier, there are two main things that set this generation apart from the previous. First is the increased L3 cache from 8 MB to 12 MB and the second is the use of what Intel calls as Thermal Velocity Boost (TVB), which can theoretically help attain turbo speeds up to 4.8 GHz. In Intel's words, "Thermal Velocity Boost opportunistically and automatically increases clock frequency up to 200 MHz if the processor temperature is low enough and turbo power budget is available". The 4.8 GHz number does raise a few eyebrows. For perspective, the 'Skylake-X' Core i9-7900X goes to a maximum of 4.5 GHz but it operates under a 160W TDP envelope while the 45W Core i7-7820HK maxes out at 3.9 GHz turbo. It seems somewhat superfluous to assume that the 4.8 GHz speed will sustain for a fair amount of time. 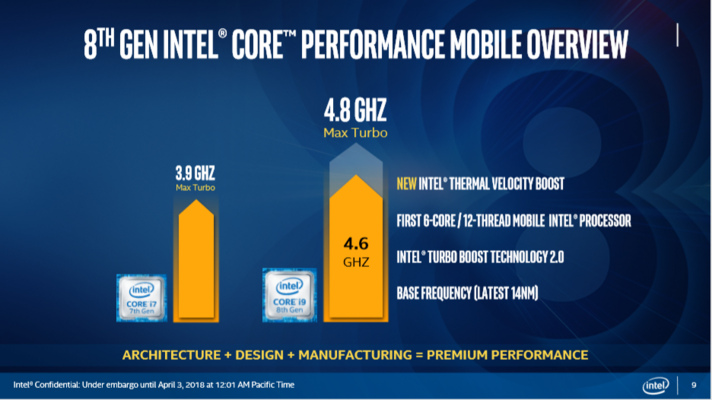 The key words in Intel's statement "processor temperature is low enough" (~50 °C or lower as per the presentation footnotes) and "turbo power budget is available" imply that the 4.8 GHz mark is more theoretical than practical and often occurs in short bursts. We should get a fair idea whether TVB is indeed beneficial or not once we get to put the chip on our test bed. According to Intel's controlled benchmarks, the Core i9-8950HK offers a significant step up from its predecessor the Core i7-7820HK. 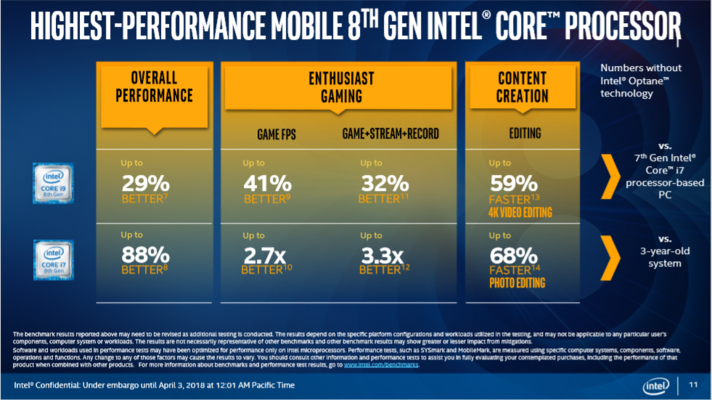 Intel claims up to a 29% overall better performance. Gaming is highly favored with up to a 41% increase in fps and the chip is apparently 59% faster in 4K video editing. Obviously, these are Intel's claims in a controlled test environment. Real world figures might or might not justify Intel's claim but with AMD zeroing in on Intel's single-core performance with the Ryzen 2 slated for launch this April, Intel would want to ensure a sufficient enough lead to prevent the gaming crowd from drifting towards AMD. We did see a few leaked Cinebench scores with the new CFL-H chips but the scores for the 8950HK seemed somewhat unrepresentative of its class. We look forward to running our own suite of benchmarks as soon as we get hold of notebooks powered by the new CFL-H chips so stay tuned for that. The Core i9-8950HK is definitely the star attraction in the new CFL-H lineup but Intel has a bevy of offerings to cater to requirements and pockets of all sizes. It starts with the Core i5-8300H and 8400H, which are 4C/8T chips having up to 8 MB L3 cache. We then have the 6C/12T mainstream enthusiast offerings comprised of the Core i7-8750H and 8850H with 9 MB L3 cache and turbo speeds up to 4.3 GHz. The 8850H has a partially unlocked multiplier that allows for limited overclocking potential. Next up, we have the Xeons with the Xeon E-2176M and Xeon E-2186M featuring 12 MB L3 cache. These CPUs come with enterprise ready features such as Intel vPro and support for ECC memory. Expect workstation class notebooks such as the Dell Precision and the HP ZBook to feature these chips. Finally, there's the Core i9-8950HK we've been talking about all this while. All CPUs are rated at 45W TDP and support dual-channel DDR4-2666 RAM along with support for Intel Optane Memory. Apart from the Xeons, the Core i7-8850H and the Core i5-8400H also support Intel vPro. We see that Intel is not too pleased in conceding the market to AMD Ryzens, which are known for offering better multi-core performance at lower price points. We have seen how the Ryzen 7 2700U almost made the Core i7-7700HQ kneel before it. Expect CFL-H powered notebooks from all major OEMs to land this summer including the much awaited Dell XPS 15 9570. How exactly CFL-H fares in comparison with CFL-S, 7th generation 'Kaby Lake', and Ryzen 7 will soon be revealed in our extensive benchmark analysis. APUs based on Ryzen 2 might collide head-on with CFL-H but for now, Intel does look to consolidate its lead as the de facto CPU of choice for the enthusiast mobile gamer — and now, content creators as well. Today at a global event in Beijing, Intel unveiled the first ever Intel® Core™ i9 processor for laptops. Part of the new lineup of high performance mobile products unveiled, the powerful 8th Gen Intel Core i9 processor is highest performance laptop processor intel has ever built to deliver the best gaming and content creation experience on the go. Building on the arrival of the new Intel Core i9 processor for mobile, Intel also announced a new Intel Core platform extension that brings together the benefits of 8th Gen Intel Core processors with Intel Optane™ memory, rounded out its family of high performance desktop CPUs and chipsets which deliver modern standby and ambient computing capabilities, and shared new details on the 8th Gen Intel Core vPro™ platform. The new 8th Gen Intel Core i9, i7 and i5 processors for laptops are based on the Coffee Lake platform and leverage the 14nm++ process technology enabling them to deliver up to 41% more frames per second in gameplay1 or edit 4k video up to 59% faster than the previous generation with same discrete graphics2. At the top of the stack, the 8th Gen Intel Core i9-8950HK processor is optimized to push the limits of performance. It is the first mobile Intel processor with 6 cores and 12 threads. It comes fully unlocked and features the new Intel Thermal Velocity Boost (TVB), which opportunistically and automatically increases clock frequency up to 200 MHz if the processor temperature is low enough and turbo power budget is available. This translates to a turbo frequency of up to 4.8 GHz. But, performance goes beyond gaming. Thanks to the rapid pace of technology innovation, the industry has broadened the access to all types of content and how people create it. It has radically redefined what creativity means, and as content has become richer and more immersive, the level of performance needed to both consume and create that content has also increased. This 8th Gen Intel Core processor family provides a powerful mobile platform for creators. In addition, the new highest-performance 8th Gen Intel Core mobile processors’ single- and multi-threaded performance allows users to enjoy the smoothest and highest-quality mobile VR and new Windows® Mixed Reality Ultra experiences. 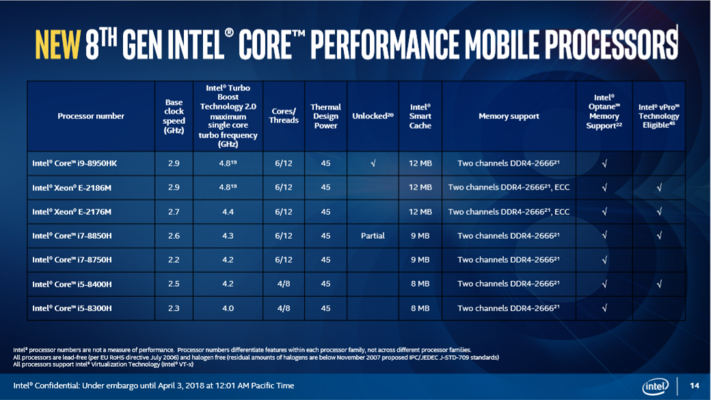 The highest-performance mobile 8th Gen Intel Core processor family also adds a new Intel® 300 Series Chipset, which adds integrated Gigabit Wi-Fi for a blazing fast connection that is capable of being up to 2X faster than standard 2x2 802.11AC 80MHz (867 Mbps)3. More on the chipset here. Intel Optane™ memory is a smart and adaptable system accelerator for desktop and mobile platforms, increasing the performance and responsiveness of SATA-based storage technology without compromising storage capacity. 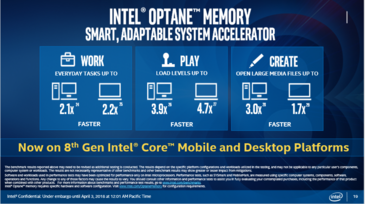 Now, Intel Optane memory is available across both 8th Gen Intel Core mobile and desktop platforms. Additionally, Intel has released a new Data Drive Acceleration feature that delivers a boost to a large secondary HDD data drive. This powerful combination provides up to 4.7 times the game loading4 and 1.7 times faster media loading5. More on Data Drive Acceleration here. 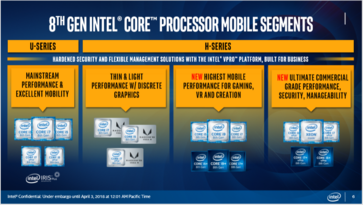 Consumers will also begin to see a new platform extension with Intel Core i5+, i7+ and i9+ badges on select systems, starting with today’s high performance mobile 8th Gen Intel Core processors and desktop processors. This indicates that they are purchasing a device that has the combination of Intel Core performance with the acceleration of Intel Optane memory. · For more on the new additions to the 8th Gen Intel Core desktop processor line, check out the product brief. 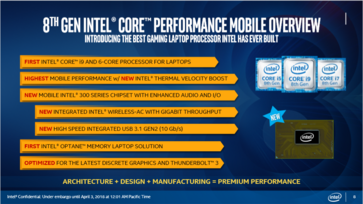 · For more on 8th Gen Intel Core vPro and processors for business, go here. Intel technologies’ features and benefits depend on system configuration and may require enabled hardware, software or service activation. Performance varies depending on system configuration. Check with your system manufacturer or retailer or learn more at www.intel.com.